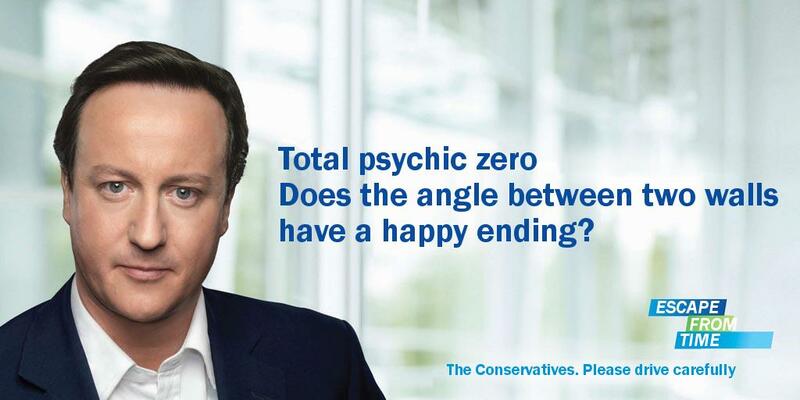 Ah, the David Cameron poster machine is on line. And it’s gold dust. Somehow, that poster seems almost designed for satire. There are excellent reasons why it works so well; it’s possibly the most stylised example of a political advert I can think of. In a sense, it’s a movie – not at all original, but highly competent in a limited way, and therefore a perfect subject for parody. You only need to identify a small number of controls, or variables, that define it, in order to produce a message that matches the requirements of the format perfectly but has an entirely different payload. J.G. Ballard, of course, was very much aware that display advertising is in some ways a programming language. Hack work is one of the standard literary experiences, but Ballard’s time as an ad copywriter must have been especially telling on his writing. Ballardian has a superb post on his 1960s project to create a range of content-free adverts, based on randomly cut-up texts and unrelated photos, that he placed in Vogue. Look at either the original, or the skits; note carefully where the content is. The backdrop is soothingly grey, but not blank – it’s chosen to be content-free but without being actually blank or being a block colour. Blank space or block colour are visual statements – in modernism, you’re being asked to concentrate on the elements of the object you’ll actually interact with, in post-modernism, you’re being asked to project your own internal imaginings onto the blank space. Either way, if you make the colour field bright red, you’re putting the viewer on notice that you want to say something. 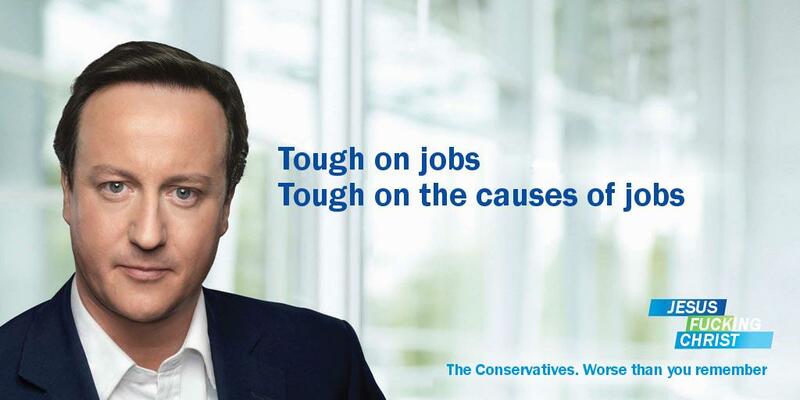 The blurred-out background of the Cameron posters is the colour of nothing. So the big pink face goes here – it acts as a graphical and thematic anchor for the eye. Thinking of the poster as a frozen movie, the action begins here. It’s also true that we’re likely to pick out the monkey in the background flow of images first – before we react to anything else on the poster, we have the chance to feel the tebbly-tebbly concerned smile at a subrational, sublinguistic level. We move on; saccading from left to right and top to bottom, the next scene is the message in big friendly letters, as Douglas Adams would say. It’s worth noting that the real thing always has two sentences, and although they are united by the same typeface (Franklin Gothic), the real poster has a slightly different colour mask for the second. This signals that there is a plot relationship between them. On the original poster, Cameron promises a crisis about the budget in the first colour, then promises not to cut the NHS budget in the second. So we’re setting up conflict and resolution here. No matter that the two statements are contradictory – in fact, if they weren’t, it wouldn’t work as a film. We move on southeastwards – first of all, we see the whizzy logo, so we know how to recognise the next element in the plot, and then, we get the pay-off, the strapline at the bottom right-hand corner of the poster. This is important – it’s the finale, and it’s got to contain something actionable, in the intelligence sense rather than the legal sense. For the first time across the vast span of three or so seconds we’ve spent watching this drama, we see the word “CONSERVATIVE”. It’s probably worth remembering that a lot of these are meant to be installed next to motorways or major rail routes, where we will in fact approach them at speed. Treating it as a film rather than a static artwork is therefore very appropriate. 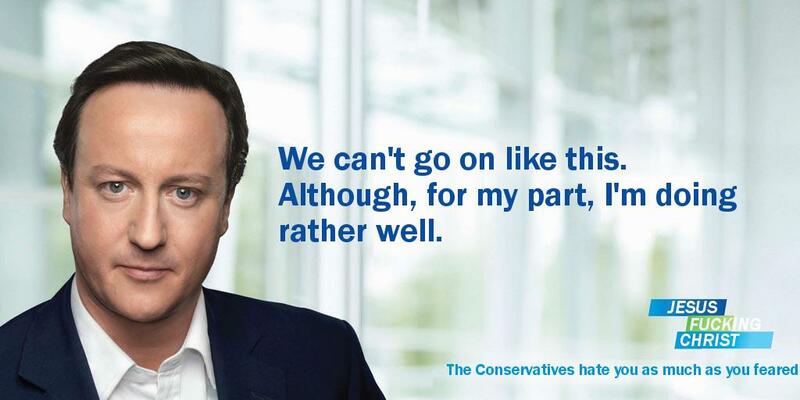 You probably want to link to the Make your own David Cameron poster page. Also adding a media coverage page and will link to this post. I like the rather subtle “The Conservaties, worse than you remember” tagline. Much better than some of the crap that mylabour poster have been pumping out. What will be next? The posters have already been turned into a 3d game (http://www.politicalgaming.com) and other copy sites are springing up.